Babies that crawl have different needs and vary from baby to baby. Some as early as 5 months right up until around 2-3 years of age need help to learn to walk. Children typically start walking as soon as they hit the 1-year mark. I have found parents often don’t have ideal flooring and this can cause irritation to babies knees. This can prevent the desire for early stages of walking and discourage them from taking their first steps. No parent wants to be a part of restricting their child’s development. The good news is that there are some solutions in the form of knee pads made specifically for this problem. The solution is to pad the knees whilst they are crawling, it’s a sure way to get them darting about without injury and help them try their utmost to get up and begin exploring the world around them. There are loads of choices to choose from, but some are clearly better than others and I will review and let you know what the best of the bunch is and help with some tips for purchasing. 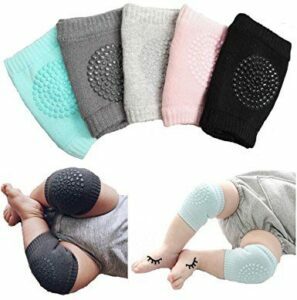 Why Get Baby Knee Pads for Your Child? Maybe you have the perfect soft carpeted flooring and still you child has irritation on their knees, which is very normal, especially if your child likes to be just in a nappy and the skin is exposed to carpet all day. Other people might have a hardwood flooring or tile and could be cold to the touch. The number of parents needing this and yet are blissfully unaware is a little startling, but obviously, your awareness and checking things out, so that’s a good start to finding the right pair-solution for your child’s sore knees. This pack of pads comes with a guarantee to ensure your child doesn’t get irritated, cuts or scrapes whilst on the move. The padding is thick enough to make sure they can crawl over raised surfaces, like the carpet connectors room to room, which helps them feel confident into standing. This knee pad is breathable and makes for a reduction of sweating in and around the joint, which makes wearing them less stressful and redirects the attention where it should be – crawling. The material is odor free, materially-safe, washable and easy to maintain, just simply put in the washing machine and let dry for another days use. The material is slip proof baby for crawling and helps with mobility and getting from A to B. The cushion inside soft to the knee and the impact is significantly reduced and offers a great padding for the delicate baby knee. The flexibility of the knee pad means it doesn’t impact on the child’s mobility and ensure there is only benefits when wearing them. These Toptim pads some in 5 different colors and provides a comfort and style with breathable material that absorbs sweat while protecting your babies delicate knees. The material is a mix of cotton, dacron, and spandex, but the main type is cotton and provides comfort for the long extended crawling sessions. This helps encourage them to crawl more and develops their ability to move onto standing. 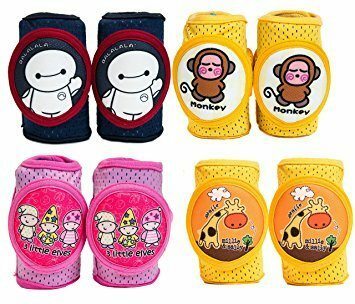 Learning to crawl is a difficult task for babies and with these held tight with elastic and padded with sponge these pads make learning fun and enjoyable. 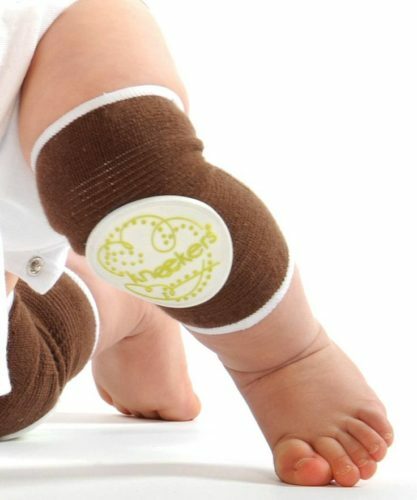 These protective elbow pads are ideal companions for babies on the move. They are breathable and provide a complete solution for crawling babies without being annoying when on the move. The bruise free material helps avoid heavy impacts and possible scraps to ensure pain-free crawling. The Anti-slip material is ideal for them to feel in control when trying to get around. The design and graphics of the knee pads are very cute and adorable when worn over their clothes. The Velcro straps are easily adjusted and stretch to be a nice snug fit without being uncomfortable for them to wear. This knee pad offers great protection for your child and will ensure when they are whizzing around on all fours they won’t get any unwanted sores hindering them from attempting the next big leap into the unknown world of standing, it must be so exciting for them. This is a snug fit and will keep fitted with them throughout the child’s crawling adventures around the house. The material is elastic, easy to fit and comfortable to wear, so no matter the circumstances the inquisitive infant will be ready for action. These pads will get them learning to walk without the hassle some parents face and I have seen some awesome advancements in kids that use them, but especially for those houses that don’t have a design to suit the crawling stage. With the amount of crawling getting done it will need to get a wash from time to time and the material will be easy to wash and dry ready for the next days crawling events. There is an array of colors to choose from and no matter the circumstances the child will have a color to match their adorable little outfit. I have given this to my granddaughter to help with the transition from crawling to walking and I remember the first steps and how proud we all were. The “Baby Knee-Pads” is the best in my opinion for the durability aspect and although they both offer similar standards of knee protection I still preferred this one after it had been washed. I asked other mothers to test and they also preferred this over the many months of use for the same reason. The price difference is small, but for this reason, I choose this as the best overall knee pad for your crawling baby. The “FlyingP Baby” is a close second and for good reason, it is a high quality as a whole but lower in price and for some the pennies mount up over the long run, so if you want a good pair that will ensure your child’s knees are protected from the hazardous trails of life on the floor then this will keep them safe. Some parents will want to buy pants or clothing that protects the knee and offers an additional cushioning within its manufacturing design, but personally, I think this is not a wise move and for good reason. So, if you have a need to buy loads of different items of clothing to ensure the safety of your child then the costs are getting significantly increased, but alternatively, the option could be buying one pair for your baby and then simply place over the child’s clothing. This is far more practical solution and offers an easy, safer and economical choice. Still Undecided What to Buy? Every parent has been through some ordeals and none more so than mom. She has brought life into this world and looked after that child in ways men will never understand. The pain she has felt has created compassion and empathy, which is why she understands the need for ensuring her child, same one she looked after for all those months, gets every little bit of care and attention in the years to come. This attention to detail has brought me to the point I decided to investigate the best baby knee pad options currently available on the market. This was to try and help those children exploring the world around them, but hopefully not in avoidable pain because life has enough pain already without us making it worse.